Go to Etching Expressions, online at etchingexpressions.com for unique personalized wine gifts. Etching Expressions offers customized etching and labels for wine bottles, champagne bottles, and liquor bottles for birthdays, weddings, anniversaries, thank yous, graduation, Mother's Day, Father's Day, or any occasion. Etching Expressions offers a variety of designs and a variety wines to suit all tastes, including Moet and Chandon, Robert Mandavi, Franciscan, Estancia Estates, and others. But before you shop, be sure to get all the latest etchingexpressions.com discounts, Etching Expressions promotions, and Etching Expressions coupon codes found here at RetailSteal.com. Etching Expressions ships within the United States, including Hawaii, Alaska, and Puerto Rico. See site for more information. Shop Etchingexpressions.com and save 10% on your total purchase with promo code. Click to shop for your favorite personalized gifts. Shop sale at Etching Expressions for up to 50% off special gifts. Save $20 on your Etching Expressions purchase when you use this coupon code at checkout. Visit Etchingexpressions.com and save $15 on your purchase of $150+ with coupon code. 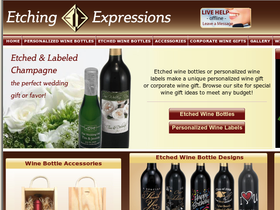 Shop at Etching Expressions for customized wine gifts for friends and family. Click link to shop. Shop for personalized wine bottles for as low as $35 from Etching Expressions. Click here to customize a gift today. Enjoy $10 savings on your entire order from Etching Expression when you use this coupon code online. Use code on orders of $100+ to qualify. Enjoy a custom etched wine bottle, starting from only $65 from Etching Expression. Click here to pick one today. Get a wood wine box for $10.95 from Etching Expressions. Click here to complete your gift.